If your property needs new doors how do you go about choosing aluminium doors for your home? With single doors, double doors, sliding patio doors and folding doors, there is a huge amount of choice. At Newlite we specialise in all manner of aluminium doors and have created this helpful guide explaining how each door works to help you decide if it is suitable for your home. Understanding the different types of aluminium doors. It is essential you choose the right type of door for your home. Doors differ to windows in being traffic doors that we use to get in and out of our home as well as opening up the home in warmer weather out to our garden. The right choice of aluminium door not only adds light, space and convenience, chosen right it could also increase the value of your property and how desirable it appears to prospective buyers. Why an aluminium door is best. Whilst PVCu and composite doors are excellent and totally fit for purpose, aluminium doors offer other benefits. Aluminium is slimmer and stronger. Aluminium doors give you bigger door panels. Aluminium doors give you bigger glass and more light. The colour choices with aluminium are the best. Choose an aluminium door and you will often not need side panels because aluminium door can span bigger structural openings. What types of aluminium doors are available? You will not have failed to notice how popular modern extensions are and the brand for big glass doors, matched with picture windows and lantern roofs. At Newlite, we can provide all of these products and much more. Doors play a massive part in any home renovation and particularly the views they can afford, together with the great light transmission. So when it comes to choosing aluminium doors, we are your local experts. The single aluminium door can be as basic or advanced as you want it. All our doors feature thermally insulated aluminium frames and door sashes. They are mechanically joined with strong corner cleats and brackets making them stand up to the rigours of family life in the home. We all use our rear doors a lot, and in aluminium is built to last. An aluminium single door can be customised with colour, door panels, integral glass blinds, horizontal and vertical glazing bars and a lot more. An aluminium door on the side of the home can even have a panel housing a pet flap. Single doors sit within a rebated frame with quality door hinges, multi point locks and lever handles. French doors you may know as a pair of door leaves. Our French doors are just like our single doors in their construction, can open in or out and can couple to fixed windows to create big screens. In aluminium, French doors can be as big as 2.4metres wide and up to 2.4metres high with many brands. Low thresholds are available to give a minimal step over as well. When chosen in aluminium, doors are much slimmer than their PVCu counterparts and do away with the big thick central mullion you see in the middle when the doors are closed. French doors are hinged and can open up to 90 degrees or more, depending on their fixing arrangement and hinges fitted. A quality bifolding door can go from two up to seven panels and span up to 8 metres if needed. A bifolding door has multiple door panels, connected together, that work in a concertina or folding action. Each door panel connects to the other with robust yet discreet door hinges. At the bottom you will find a roller mechanism set into a special threshold. At the top of the doors are the guides that keep the tops of the doors in place as you move them along. The best thing about bifolding doors is how they can open up an entire wall in your home, linking the inside to the outside. Bifolding doors are highly desirable and can give lovely views whether open or close. 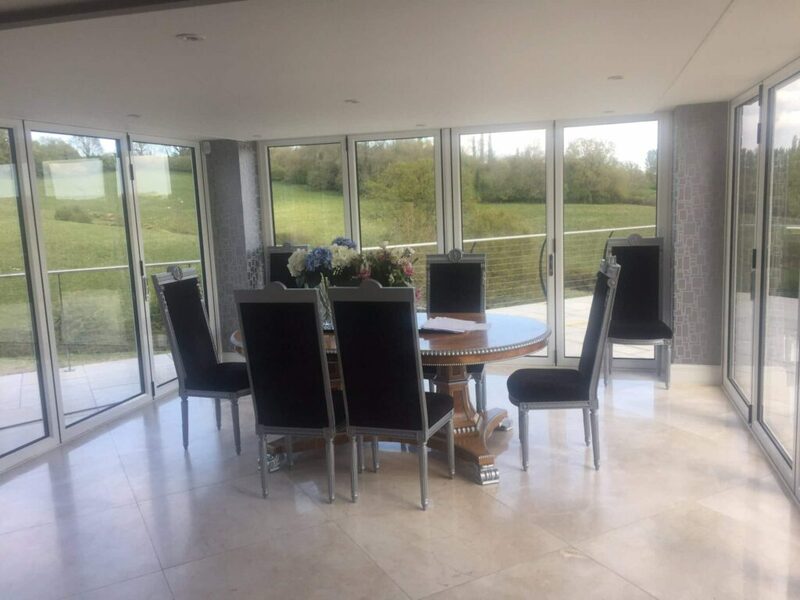 Most bifolding door panels can go up to 1.1 metres wide and up to 2.7 metres high with most systems giving you lovely large doors that let the light flood in and let you enjoy the views outside. Sliding doors sit within an aluminium frame and track that surrounds the sliding panel. At the bottom of the sliding part of the door are heavy-duty door rollers that effortlessly slide the door open and close. Sliding patio doors offer the biggest panes of glass and therefore, the best possible views. How you configure your sliding doors also gives you flexibility. A sliding door will not open up as much of your opening as a bifold but offer half or two-thirds clear opening. Some sophisticated bifolding doors can be up to 3 metres in height; others can slide into the wall disappearing from view. What aluminium door is best for your home? French Doors. Best for value and smaller apertures. Folding Doors. Best for opening up your home to the outside. Sliding Doors. Best for the biggest glass sizes and the best views. Need help in choosing aluminium doors? Contact us today. At Newlite, we can improve the front or back of your property with our quality range of aluminium doors. All our doors feature premium security features, great colour choice and quality door handles. You can even customise your doors by fitting integral blinds, trickle vents and other door hardware. Contact us today for a free quotation and no-obligation home survey.